Flowers to Mumbai, Send Flowers to Mumbai Same Day, Send Lilies Bouquets. 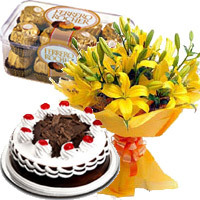 Send Flowers in Mumbai.Mumbai Online Gifts offers stunning Lily Flowers to Mumbai.For online delivery of Colorful Fresh Flowers, place an order with Mumbai Online Gifts. LILY is perfect choice of flower in a Wedding bouquet. If you're looking for flower meanings like friendship and devotion, Peruvian lilies are the choice for you.lilies are the 30th anniversary flower - while lilies of the valley are the 2nd wedding anniversary flower. Why should you choose the Mumbaionlinegifts.com- We provide flowers delivery all over the Mumbai and also deliver the flowers to Thane, flowers to Navi Mumbai. 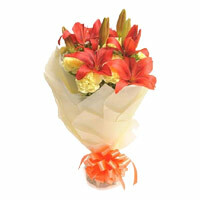 Same day delivery of Flowers to any where Mumbai. Midnight delivery of flowers to Mumbai. Free home delivery of flowers to Mumbai every where. Guranteed flowers delivery to all over Mumbai . Flower delivery network using florists across the Mumbai who hand-deliver flowers, bouquets and arrangements for fast delivery in Mumbai. The Aggregate Rating of this Webpage is 4.18 Out of 5 Based on Rating Received from 39 Customers.